The Barbizon School of art was a movement focused toward Realism which existed between about 1830-1870, centered in the village of Barbizon, located at the edge of Fontainebleau Forest, not far from Paris. Barbizon school painters included Jean-Francois Millet, Theodore Rousseau and Charles-Francois Daubigny. The group was heavily influenced by British painter John Constable, who had abandoned the formalism primarily practiced at the time and was painting rural landscapes as main subject matter rather than as just a background to other central subjects. Many French artists of the time gathered in Barbizon to create natural works, painted in the open air rather than in the studio. We have a fine collection of Barbizon art prints, Barbizon etchings, and what are known as Fontainebleau art prints, named after the forest adjacent to Barbizon where many of the artists found favorable subject matter. 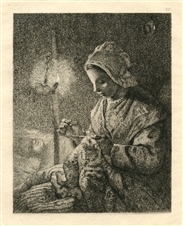 Medium: etching (etched by Gustave Greux after the Corot painting). Published in Paris by L'Art ca. 1880, this splendid impression was printed by Francois Lienard on japon paper, and tipped (lightly mounted along the top by the publisher onto a sheet of heavy Bristol paper). The image measures 5 3/4 x 8 1/8 inches (148 x 205mm). Unlike the final published state, this special impression is signed in the plate by both Corot and Greux (not hand-signed). Medium: etching. Catalogue reference: Sanchez and Seydoux 1892-13. Etched by Henri Guerard after Corot. Printed on wove paper in Paris by Eudes & Chassepot and published by the Gazette des Beaux-Arts in 1892. Image size: 5 1/4 x 8 inches (140 x 203 mm). Plate-signed by Corot, not hand-signed. Jean-Baptiste Corot etching "Le Lac"
Medium: etching. Etched by Felix Bracquemond after Corot. Printed in Paris by Delâtre and published by the Gazette des Beaux-Arts in 1861. Image size: 4 7/8 x 5 3/4 inches (122 x 145 mm). 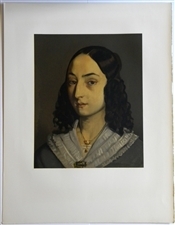 This impression was printed on chine-collé paper. Signed in the plate, not hand-signed. Medium: etching. Etched by H. Lefort after Rousseau and published in 1890 in an edition of 200. This is a nice impression printed on a japon-style paper. 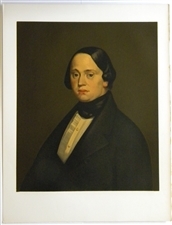 The image measures 3 1/4 x 5 inches (83 x 128 mm). Plate-signed, not hand-signed. Medium: etching. 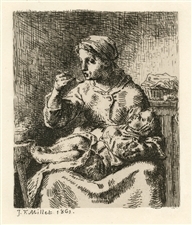 Etched by Laguillermie after Corot and published in 1890 in an edition of 200. This is a nice impression printed on a japon-style paper. The image measures 4 3/4 x 5 3/4 inches (120 x 145 mm). Signed in the plate (not by hand). Jean-Baptiste Corot etching "Near the Village"
Medium: etching. Etched by C. Bertaut after Corot and published in 1890 in an edition of 200. This is a nice impression printed on a japon-style paper. The image measures 3 3/4 x 6 inches (97 x 152 mm). Signed in the plate (not by hand). Jean-Baptiste Corot etching "Le Lac de Garde"
Medium: etching. Etched by C. Bertaut after Corot and published in 1890 in an edition of 200. This is a nice impression printed on a japon-style paper. The image measures 4 1/4 x 6 1/2 inches (108 x 165 mm). Signed in the plate (not by hand). Jean-Baptiste Corot etching "L'Arbre Brise"
Medium: etching. Etched by C. Bertaut after Corot and published in 1890 in an edition of 200. This is a nice impression printed on a japon-style paper. The image measures 4 1/8 x 6 3/4 inches (105 x 170 mm). Signed in the plate (not by hand). Jean-Baptiste Corot etching "Une Passeur a l'Ile Saint-Ouen"
Medium: etching. 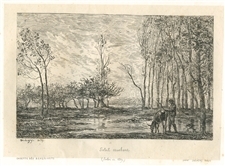 Etched by Laguillermie after Corot and published in 1890 in an edition of 200. This is a nice impression printed on a japon-style paper. The image measures 3 1/2 x 5 3/8 inches (90 x 136 mm). Signed in the plate (not by hand). Jean-Baptiste Corot etching "Bouquet d'Arbres"
Medium: etching (etched by Gustave Greux after the Corot painting). Published in Paris by L'Art ca. 1880 and printed by Francois Lienard on laid paper with full original margins. The image measures 5 3/4 x 8 1/8 inches (148 x 206 mm). Not signed. Narcisse Virgile Diaz etching "Mare a la Vallee de la Sole"
Medium: etching. Etched by G. Greux after Narcisse-Virgile Diaz de la Pena and published in 1890 in an edition of 200. This is a nice impression printed on a japon-style paper. The image measures 3 1/2 x 5 1/4 inches (90 x 135 mm). Plate-signed, not hand-signed. Narcisse Virgile Diaz etching "Fontainebleau"
Medium: etching. Etched by C. Bertaut after Narcisse-Virgile Diaz de la Pena and published in 1890 in an edition of 200. This is a nice impression printed on a japon-style paper. The image measures 4 1/4 x 6 1/4 inches (110 x 160 mm). Plate-signed, not hand-signed.